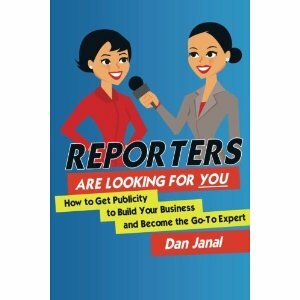 Get More Publicity from PR LEADS, ProfNet and other publicity leads services when you read the great tips and ideas in “Reporters Are Looking for You!” the long-awaited new book by Dan Janal, President of PR LEADS! The good news is that reporters need you to write their stories. The bad news is that hundreds – or even thousands – of experts and sources are competing for the attention of those reporters. Now you can stand out from the crowd and see your name in print with the new book REPORTERS ARE LOOKING FOR YOU! Follow these easy, proven tips from Publicity Coach Dan Janal, founder of PR LEADS, the most cost-effective publicity leads service in the industry! He’s helped more than 5,000 people just like you get quoted in The New York Times, Forbes, Harvard Business Review, and top media for women, fashion, education, health, fitness and business. You’ll also learn how to manage your time more effectively so you don’t waste time and make the best use of your time. You’ll also learn what to do with the publicity you get so you can get more sales and even more publicity. If you aren’t getting all the publicity you deserve, then you need to read this book! Let’s get started. You are this close to seeing your name in print and building your business with publicity!